After years of going to gun shows, I’ve grown used to seeing the same people selling the same stuff, and in most cases they are at the same tables every time. So it was something as a surprise when I was sauntering through a gun show and happened across a new vendor selling the in-the-waistband Stickyholster. For the unfamiliar, a Stickyholster (proper noun) has no belt clip. Instead, the entire outside of the holster is covered in a high-friction material, very similar to those rubbery pads used to keep your stuff from sliding off the dash in your car. You carry it inside your waistband and the friction from your belt or just your clothes holds it in place. Yep…that’s it. The vendor had a sample Stickyholster with a plastic Glock training gun I could stuff in my pants and try for myself. I had my doubts about trusting nothing more than the laws of physics to keep a loaded firearm safely in place, but this product made such a great first impression on me that I risked $24.99 to buy one. Wow, I’m glad I took that chance! I was pleasantly surprised to find out that the gun slides in perfectly the first time and unlike leather, the Sticky does not need any conditioning or “break in” period. There is no room for gimmicks when it comes to carrying a gun, and the Stickyholster takes its role seriously. I have jeans and shorts that do not have enough slack in the waist to accommodate my Smith & Wesson .40 Shield when I’m using my usual leather IWB holster with a belt clip. But when I use the thin Stickyholster, it’s a comfortable fit. I carried my gun all over the place: Bending, stretching, sitting…going about my daily life with zero issues related to my holster. I felt completely at ease that my weapon would stay exactly where I placed it. I may dump the leather rig outright and use the Stickyholster all the time. Stickyholster adds very little bulk to the Smith & Wesson .40 Shield. 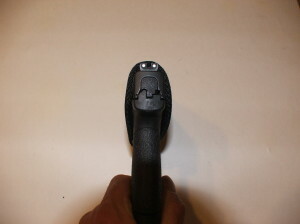 My model MD-2 is specifically made for my Shield and it covers the entire trigger area and nearly all of the slide. In addition to being a larger surface area for the sticky stuff to work, it gives the added bonus of helping keep dirt and sweat out of the gun. The Stickyholster does everything it’s supposed to and takes up way less space than leather versions. The complaints are small, but notable. First, there is the $24.99 price. Synthetic neoprene holsters can be bought for about ten bucks, and the Stickyholster isn’t much more than that. So even if functionally it is a terrific product, the double-and-then-some price tag is out of line for what you get. Second, I do not expect my Stickyholster to last as long as leather. It’s well made, but there is no way this thing is going to last like a good ol’ dead cow. I also don’t know if the sticky properties of the material will fade with age. Time may quell my doubts, and if it does I’ll cheerfully eat my words. For the here and now, Stickyholster is a winner. Pros: Takes up almost no space, works as intended. Not a gimmick. Gives added protection from dirt and sweat. No break in or conditioning needed. Cons: Overpriced. Not as durable as leather or plastic. Unknown long-term performance. Bottom line: Innovative & functional albeit costly gun holster delivers on its promises. product review stickyholster, stickyholsters, sticky holster, MD-2.